.. :: Mr. Square :: ..
التوافق : 2.3 و ما فوق . الحجم : 27 ميغابايت . لعبة بسيطة, ذات تصميم بسيط .. فكرتها جعلت هذه اللعبة مشهورة جداً ..
حسناً, ستأخذ دور "شيئ ما", و ستقوم بطلاء الحائط ..
كلما تقدّمت في المراحل, كلّما رأيت العوائق وتزداد الصعوبة اكثر فاكثر, و التّي ستتطلب منك بعض التركيز لحلهّا . *لاتستهلك طاقه كثيره = مجربة 3 ساعات و شحن 43% تقريباً . * لا تستهلك رام كتير . The task is simple, you need to paint all the floor! It would be easy for Mr. Square, but the floor is so slippery that he always slide till the end of the path. As if that wasn't enough, you can't cross an already painted floor. Ok, so the simple task isn't that simple! 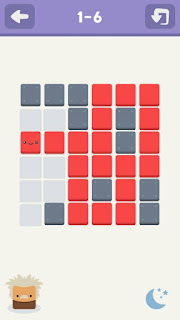 Mr. Square will need your help to solve all those puzzles! There’s 150+ levels distributed in chapters and many others in the workshop.